Billy Blue's 4 is the most advanced solution for analyzing and monitoring telephone traffic for Cisco UCM, BE6000-7000 and HCS. Complete, scalable and ready to use, Billy Blue's meets the needs of single- and multi-site clients, from a few to 50,000 extensions. 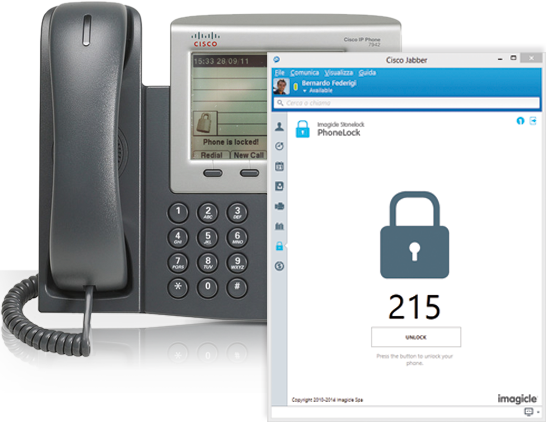 It is certified Cisco Compatible and has been chosen by Cisco as its official solution worldwide. As of February 2012, Billy Blue's 4 is available for purchase directly on Cisco GPL through the Solutions+ program. 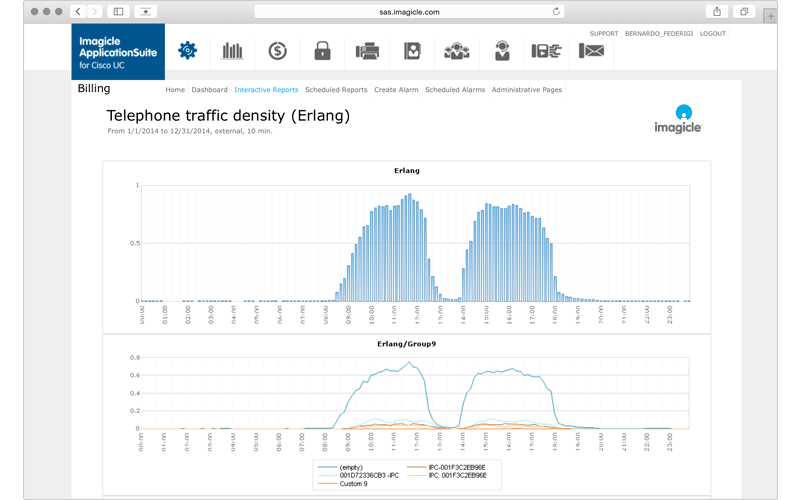 for monitoring telephone traffic in Cisco UC platforms. 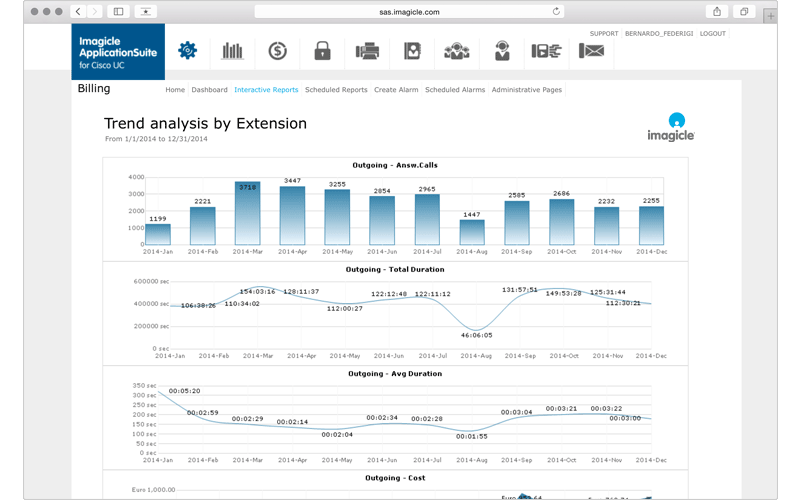 Dashboard, alarms and dozens of easy and ready-to-use reports with e-mail scheduling with the frequency you want.  Multi site-country-timezone-currency-cluster-platform-carrier. Also ready for telephone system networks. 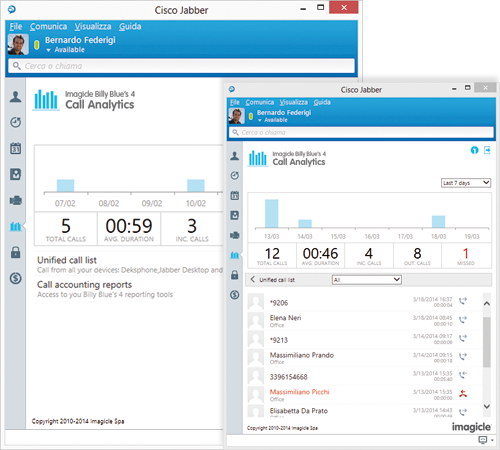 Jabber gadget to view telephone costs and a single call list per telephone, Jabber desktop and cell phone. 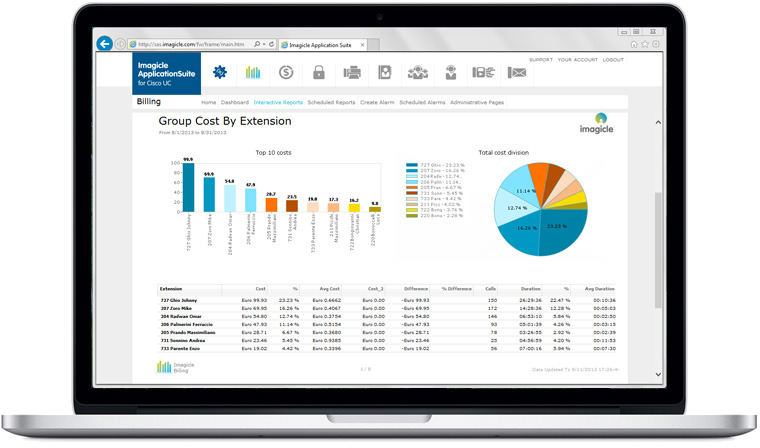 Audit file available, including reports usage and relevant data visibility for both Billy Blue's 4 and Budget Control. Yes, requires optional Budget Control app and StoneLock app for phone locking when budget is reached. 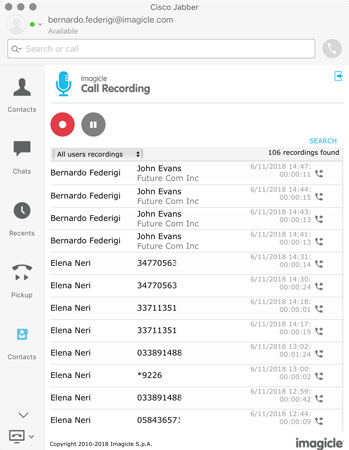 Access from Jabber client to personal unified call registry and remaining personal budget for phone calls. The solution is officially certified with the release 12.0 of Cisco UCM, BE6K/BE7K. 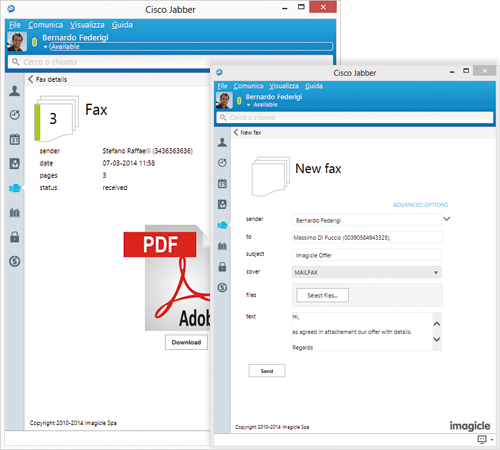 Billy Blue's 4 is available directly on Cisco Global Price List through the Solution Plus Program along with Directory and Fax. 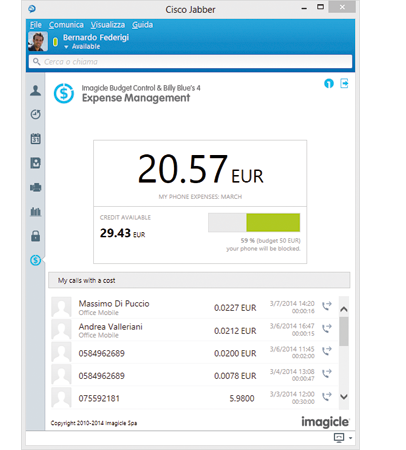 Imagicle Accounting & Billing helps you reduce unnecessary waste, easily and with no complicated controls..
Imagicle Accounting & Billing helps you reduce unnecessary waste, easily and with no complicated controls. 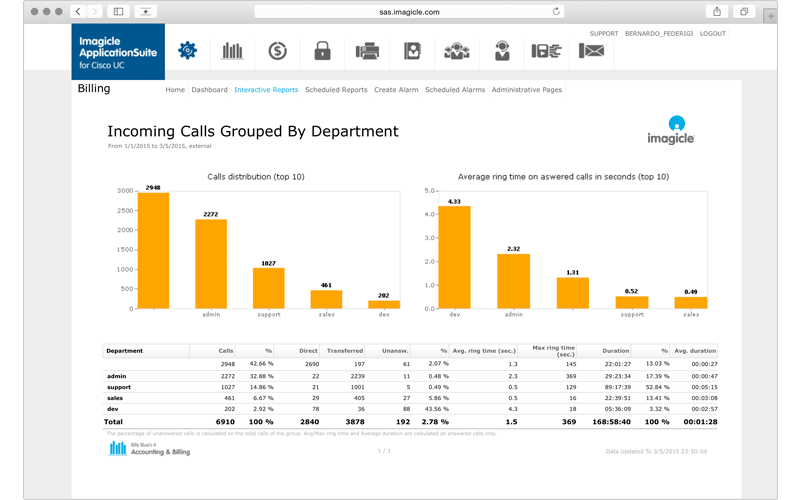 Billy Blue's 4 lets you perform any kind of analysis on outgoing, incoming and internal calls, through pre-set and ready-to-use reports and dashboards, that can be customized with filters and groupings. Budget Control + PhoneLock to save money. 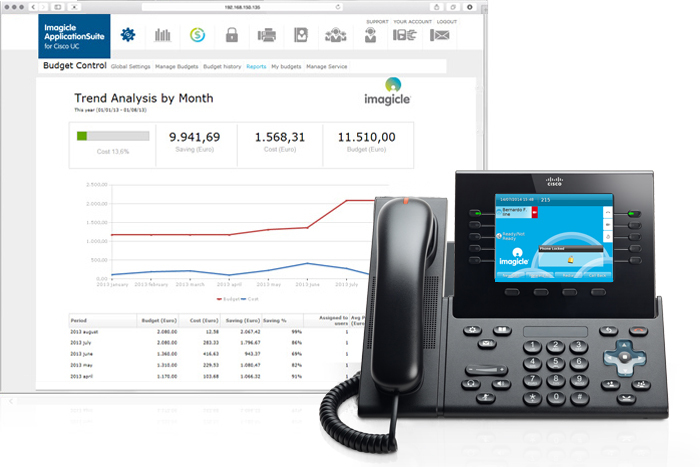 You can intelligently assign a budget for the calls of each user, department and cost center. You can receive notices when the spending budget is exceeded, and above all, lock phones to prevent unauthorized calls. 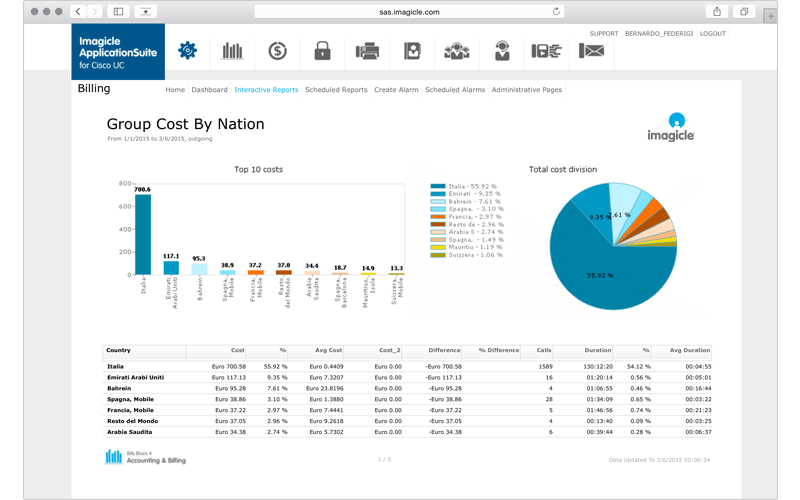 With the additional Budget Control module, you can decide in advance how much you want to spend, monitor your budgets in real time and automatically lock your company's phones to avoid nasty surprises when the phone bill arrives. You can easily manage and customize any per usage or connection-fee price list, and calculate the cost of your LCR based on complex routing according to time/line/number/operator code. Billy Blue's 4 keeps close watch so you can get your work done. 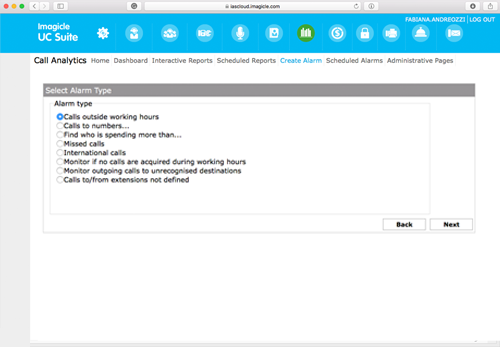 With alarm scheduling, any undesired event automatically results in an alarm being sent to your e-mail. 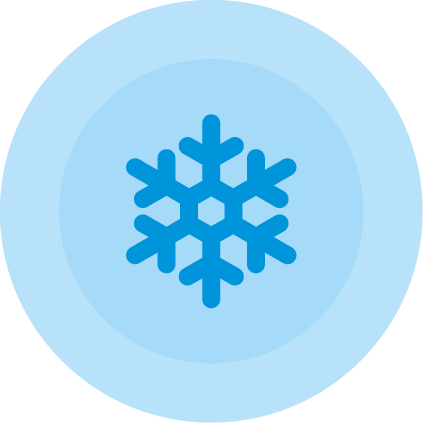 Billy Blue's 4 supports single-site and multi-site deployments as well as single cluster and multi-cluster (with no overlapping dialing plans) environments. It can also support hybrid environments with a combination of CUCM, BE6k-7k and HCS. It is licensed per server, per number of supported extensions, regardless of the number and type of site. This fits particularly well with typical distributed environments where Cisco sells CUCM solutions, since it minimize costs independently of the number of branches. It receives the raw CDR from the UCM through the FTP/SFTP protocol. It associates the user making/receiving a call through the combination of the extension and partition in the CDR, so it fully supports overlapping dialing plans over different partitions as allowed by Cisco UCM. Through the optional REM CDR module, Billy Blue's 4 can collect and process CDRs produced by remote sites in SRST geographical survival mode, in case of connectivity issues with the main UCM cluster. Billy Blue’s 4 supports active-hot stand-by redundancy. That means only Billy Blue’s 4 Primary server receives CDR information from CUCM. Calls data is processed and locally stored into embedded SQL Server DB. 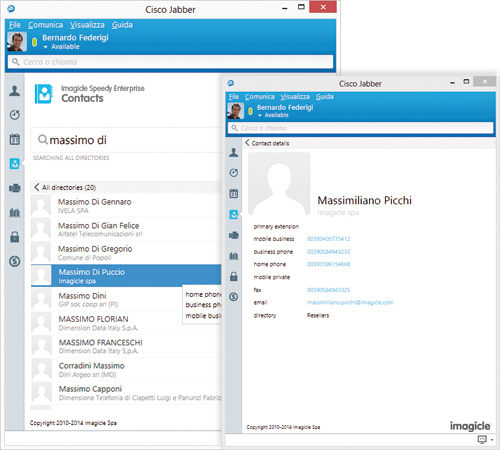 At the same, calls data is replicated on backup Imagicle server, in real time. In case of failure of the primary Billy Blue’s 4 server, backup unit can be accessed for reporting and alarms related to CDR data collected up to failure time. When Primary Imagicle server comes back in service, CUCM sends all buffered CDRs to Imagicle Primary server. No calls data is lost, at any time.